Once upon a time in a small village in Boston there were two good buddies living together. A dog named Francis and a puppet named Kirk. These two guys were like two peas in a pod, they did everything together. Including triking! One day Francis thought it would be a good idea to show Uncle Sam how much they loved their village and their taxes. 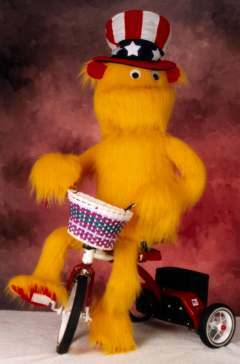 Francis then suggested taking some cool action shots of Kirk riding his trike around their studio apartment. Kirk agreed and quickly jumped on his laptop and ordered a stylish hat off of ebay. That night they were both so excited for the hat to come they could barely sleep. The next morning came and the hat arrived by noon. Kirk put on his hat and jumped on his trike while Francis put film in his camera. They spent the whole day taking pictures, laughing and eating pizza. The following day they mailed some of their pictures (including the one above) to the White House. A week passed and they never heard anything back from the White House regarding their pics... Kirk was sad but Francis was really upset because he thought it was due to his poor photography skills. About two weeks later they received their package back unopened. They both looked at the package and then looked at each other and then they realized they forgot to put any postage on the package. They laughed for days on end.